Properties purchased to form Vanderbilt. map source: R. A. McGaw, The Vanderbilt Campus: A Pictoral History, copyright 1978, Vanderbilt University Press, p.17. Except along roadways, there were very few trees. (See an analysis of trees that predate the campus for more information). A notable exception was the area near the farm residence (Old Central) which had been the home of A. B. Beech and before that the Henry Foote family.3 Near this building were several large oaks that have been significant in the history of Vanderbilt. To the west was the “Garland Oak”, a large overcup oak that was mentioned in early deeds because it marked the corner of three of the tracts purchased by McTyeire. 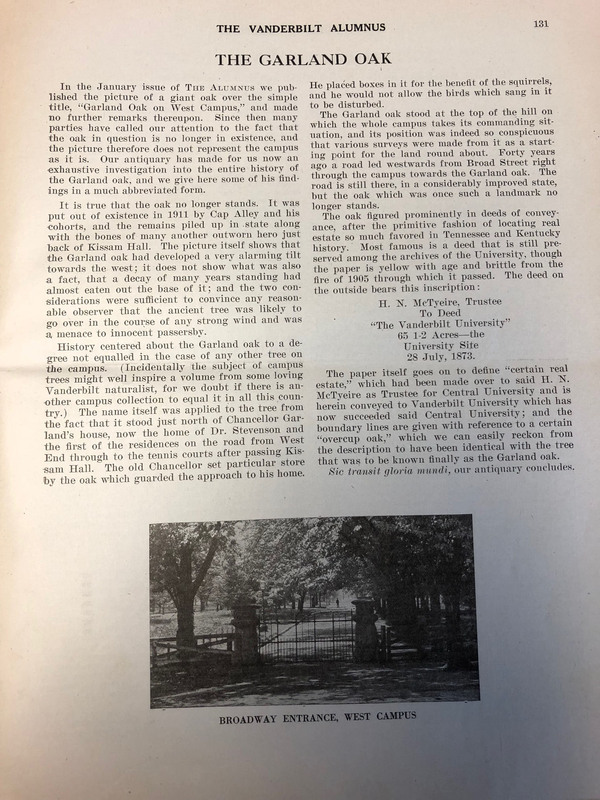 It received its name because it grew near the home of the university’s first chancellor, Landon Garland, who put squirrel boxes in its branches.4 To the south was the large bur oak known as the Bicentennial Oak, which still stands in the greenspace between Garland Hall and Rand. Another large bur oak stood closer to the back porch of Old Central. 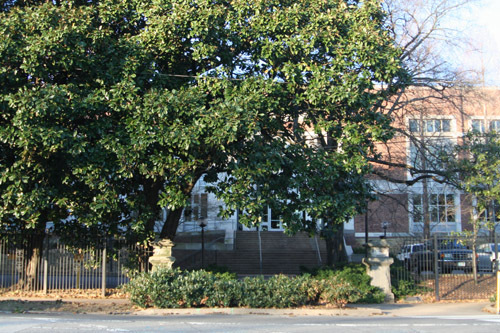 There were several large trees near the Vaughn home which may have been there before the founding of Vanderbilt. This includes a large sycamore that is still at that location (now the Steven Center courtyard) today. It is evident from the quote above that McTyeire considered the trees he was planting to have an educational purpose in addition to an asthetic one. 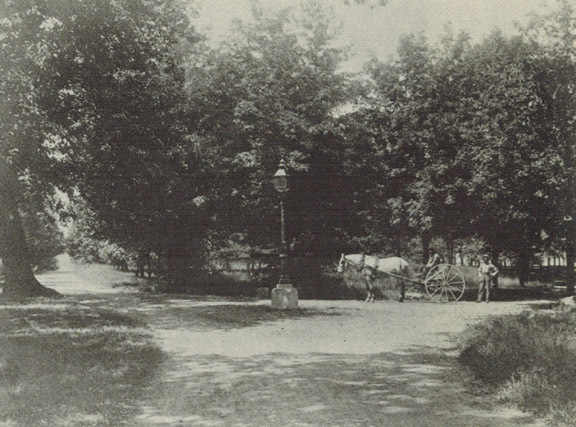 This educational mission was reflected in the designation of the campus grounds as “the Arboretum” as early as 1878. 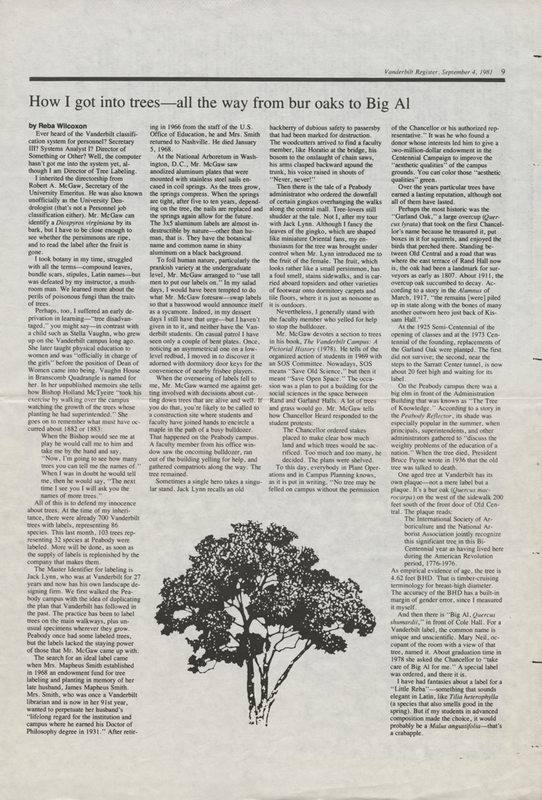 Under the direction of Dr. Safford, Professor of Botany, and the landscape gardner, Mr. D. Douglass, donations of many species of trees were accepted and planted in the arboretum. 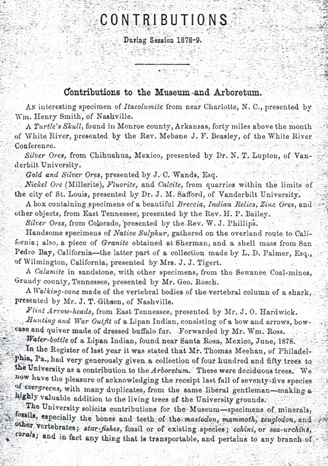 Over 500 trees were donated by Thomas Heehan and were systematically recorded in a Catalogue of the Species and Varieties of Plants in the Vanderbilt Arboretum in May of 1879. Some of these trees were probably the ones McTyeire quizzed Stella Vaughn on in about 1882 or 83. 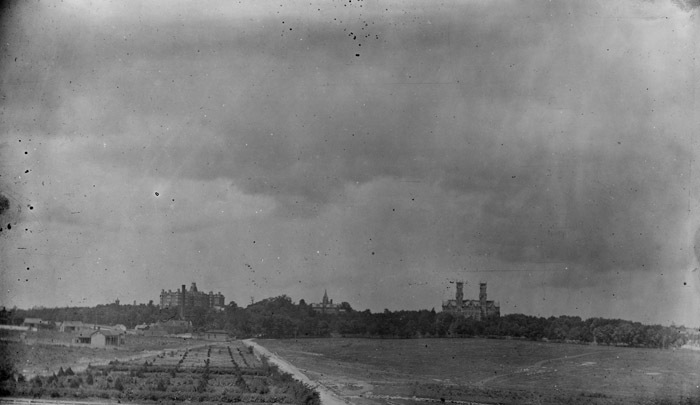 By 1890, the campus was an island of trees, still surrounded by a sea of agricultural fields. The famous Garland Oak (left) and groundskeepers. (left) David Douglas on horse-drawn rake, first superintendent of grounds, (right) Virgil Henley, assistant. Kirkland Hall visible in distance on right. Present day location: Rand terrace facing West End Avenue. source: Photo by Harry S. Vaughn in early 1900s. 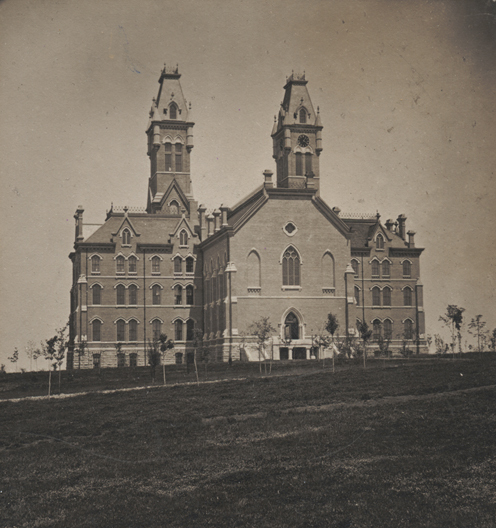 From the Vaughn Collection, Vanderbilt University Photographic Archives in McGaw, Robert A. 1978. 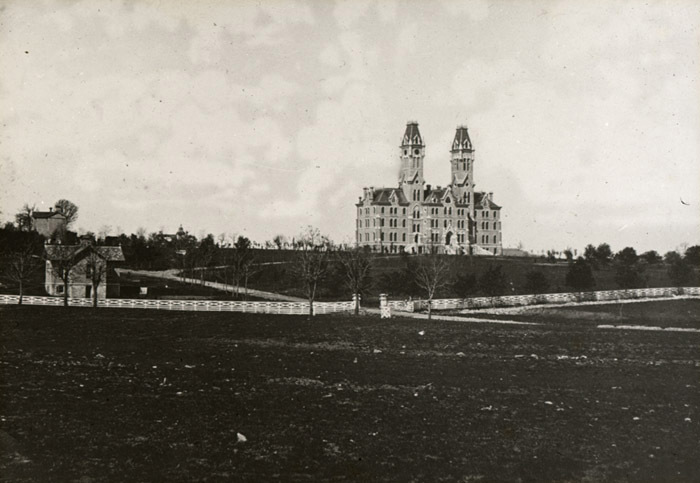 The Vanderbilt Campus: A Pictoral History, Vanderbilt University Press, Nashville, p. 139. 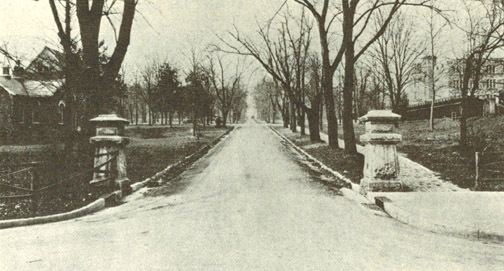 By 1900, the trees flanking the main entrance to campus (which were small trees in the 1875 picture) had matured. Although it can’t be known for sure if these any of these trees are the ones still growing along 21st Avenue, the stone gateposts can still be seen along the sidewalk in front of the Law School. 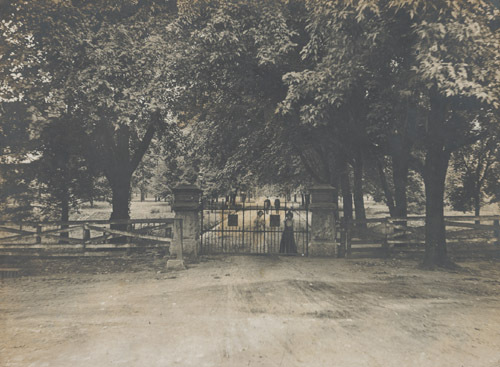 Broad Street entrance to Vanderbilt campus 1917. Notice that the entrance has been widened to accommmodate cars. Also note the two missing trees between the camera and Furman. source: 1917 Commodore, p.17 in McGaw, Robert A. 1978. The Vanderbilt Campus: A Pictoral History, Vanderbilt University Press, Nashville, p. 62. Original Vanderbilt gates in 2014. The Law School now blocks the original entrance route. 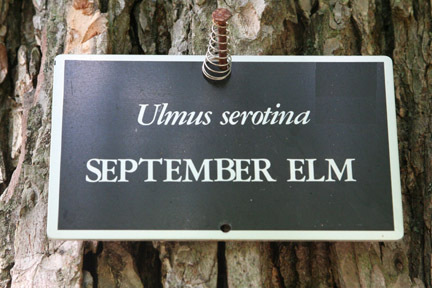 A well-known feature of the Vanderbilt arboretum is the labels that are found on many of the trees on campus. This effort began as a project of the Vanderbilt Garden Club in 1953, along with the first complete inventory of trees since the 1879 list. Mrs. S. R. Schealer chaired a committee which included representation of the Biology faculty: “Mrs. Ernest Goodpasture, Dr. Elsie Quarterman, Dr. George Mayfield, and assistance from Dr. Harold Bold. 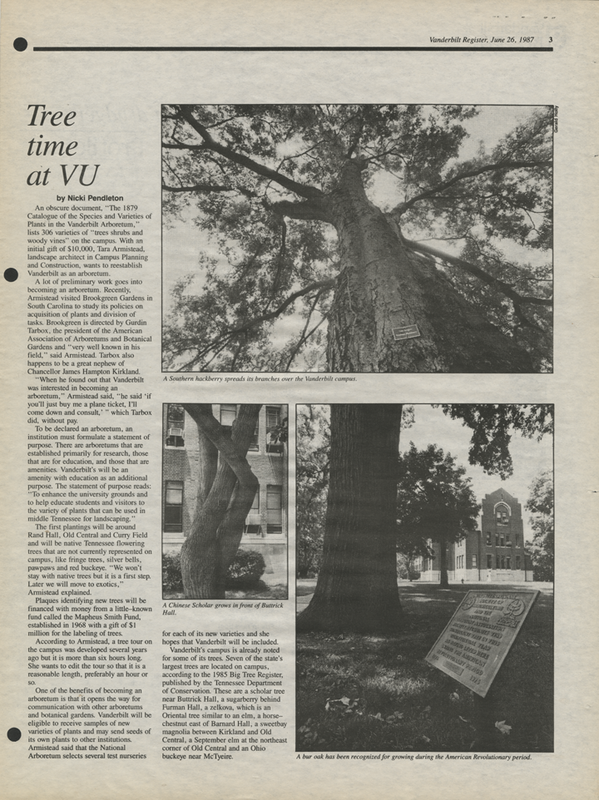 These gave generously of their time and considerable thought to the needs of the Vanderbilt campus; especially to the project of labeling the trees on campus. We divided the campus into sections and spent three days counting, checking and listing all the trees. Since this work was carried on during the winter months (due to the idea of marking them the following spring and summer) the program was especially difficult due to the fact that the trees were not in leaf, and without the aid of these specialists I feel the work could not have been finished on schedule. … This list13 was complete and up to date as of June 1, 1953. On February 1, 1954, Dr. Bold planted two new species on the campus (an Umbrella tree and a Cork oak), and Mrs. Goodpasture added a Chinese Scholar tree. This effort had two tangeable results. The club donated $50 to buy several hundred plastic markers that were placed on trees by the Beta Beta Beta Club (a biology honarary society) under the direction of Dr. Quarterman. Thus began the tree-labeling effort that has continued until today. 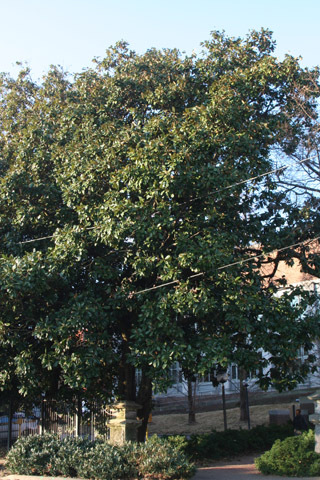 The other result was that a number of trees on the list were acquired and planted.The Chinese scholar tree mentioned in the report was planted in front of Buttrick Hall (the biology building) and was eventually declared a Tennessee State Champion Tree (although it is now dethroned). Also planted around Buttrick were two red buckeye trees flanking the front door, and an American smoketree behind the building (cut down when the addition was added to the back side of Buttrick). A horse chestnut tree was planted next to the main library building, and bigleaf magnolias were planted between Garland and the Divinity School. Will Ella (Willa) Tatum (Mrs. James Mapheus Smith) in the early 1900s. 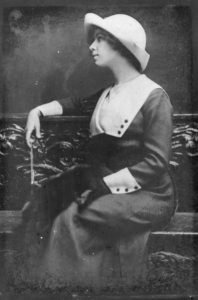 She was a librarian at Vanderbilt from 1922 to 1931 after working at the Library of Congress, and was reported to have dated Robert Penn Warren before marrying Dr. James Mapheus Smith. source: Joel Tatum (nephew of Willa), used with permission. In 1968, Mrs. James Mapheus Smith donated $15,00015 to establish an endowment16 in memory of her husband to support tree labeling and planting.17 18 This fund has supported the purchase of the hundreds of aluminum labels that have been attached to the trees on campus. As the tree grows, the coil springs that surround the nails keeps the label in position without damaging the tree. Magnolia screening the Law School from 21st Avenue S. This may have been one of the trees tended by Margaret Branscomb. Photo by Steven J. Baskauf. Click on the image for further information. The many magnificent southern magnolias are one of the prominent features of Vanderbilt’s campus today. Southern magnolias had been planted on campus since the 1870s and the species is listed in the 1879 catalogue of the arboretum. There are a number of individual magnolias that are known to be at least 100 years old. The magnolias that surround Bishop McTyeire’s grave were probably part of the original plantings of the campus. Chancellor Kirkland noted in his 1893 inaugural address that “under the shade of magnolias that his own hand planted, he sleepeth well”.19 There are also a number of large magnolias that are recognizable on the first aerial photos of campus taken in the 1920’s. These include 5 magnolias along the north side of Magnolia Circle and a large magnolia in front of Buttrick Hall. The “circle of magnolias” that surrounds the campus was the brainchild of Margaret Branscomb who suggested the idea while she was president of the Vanderbilt Garden Club in 1954. “I think that the Garden Club must have been the only group that cared what the campus looked like. A busy city street ran across the campus, and it was exposed on all sides to city traffic. … I was impressed by seeing so many beautiful magnolia trees in Nashville, and thought of the noise and dust a think row of magnolias would lessen, to say nothing of the campus being so open to the public view.”20 The circle of magnolias did with trees what Edward Stone’s 1947 campus plan did with buildings. 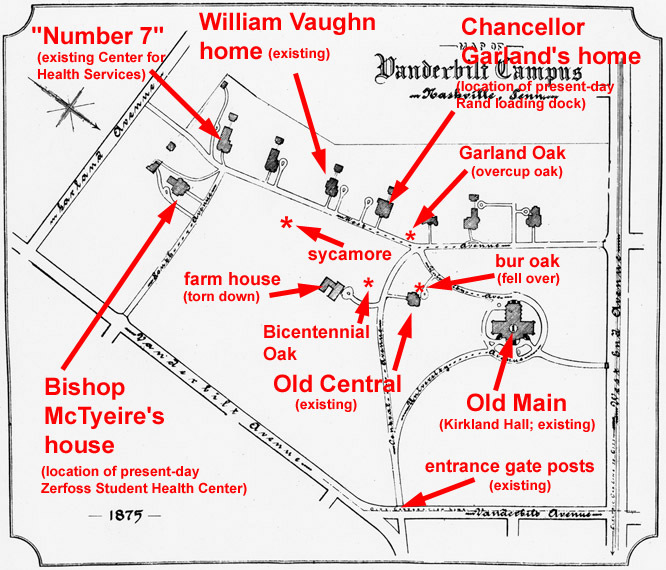 Chancellor Branscomb presided over a massive building campaign based on Stone’s plan that placed new buildings around the perimeter of the campus.21 The screen of trees and buildings helped to create the distinctive and peaceful environment in the center of Vanderbilt campus that often surprises visitors to the urban campus. After ten years, the screen of magnolias was effectively complete. Because the arboretum consists of the entire Vanderbilt campus, its maintenance must be coordinated with the overall management of the buildings and grounds. This duty falls to the Campus Planning and Construction unit with the University Landscape Architect serving as the director of the arboretum. Each year about 150-200 new trees are planted on campus as part of landscaping for new construction and to replace trees that are lost. 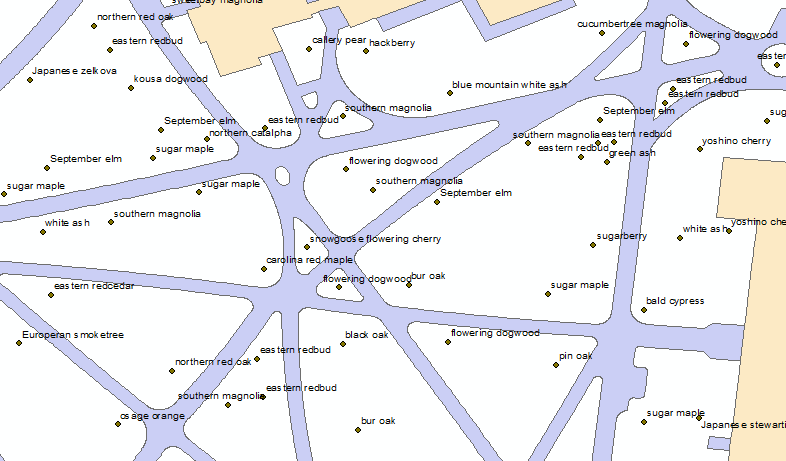 The location and taxonomic identity of over 6000 trees is documented in the tree layer of the campus GIS database. Each year thousands of students and visitors to campus enjoy the results of 140 years of planning and planting of trees on the campus. Vanderbilt’s love and care of the trees in its arboretum should guarantee that they will be there for future generations. 1 Conkin, Paul K. 1985. Gone with the Ivy: A Biography of Vanderbilt University, University of Tennessee Press, Knoxville, p.19. 2 Hogge, Sharon. 1998. The Real Dirt: A History of the Vanderbilt Garden Club for Campus Beautification, The Vanderbilt Garden Club, Nashville, p. xix. Quote of Robert McGaw from 1983. 3 McGaw, Robert A. 1978. The Vanderbilt Campus: A Pictoral History, Vanderbilt University Press, Nashville, p. 16. 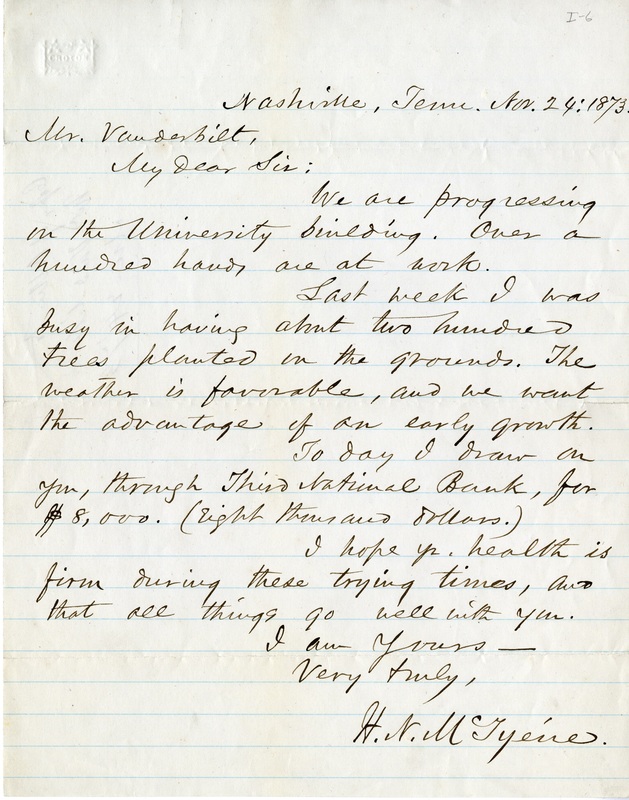 4a Letter from Holland McTyeire to Cornelius Vanderbilt, 1873 Nov. 24. 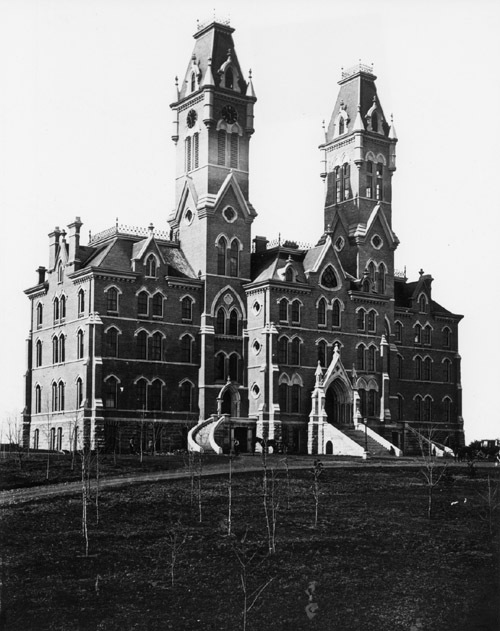 Vanderbilt University Special Collections and University Archives. 5 Quoted in Wilcoxon, Reba (1981). 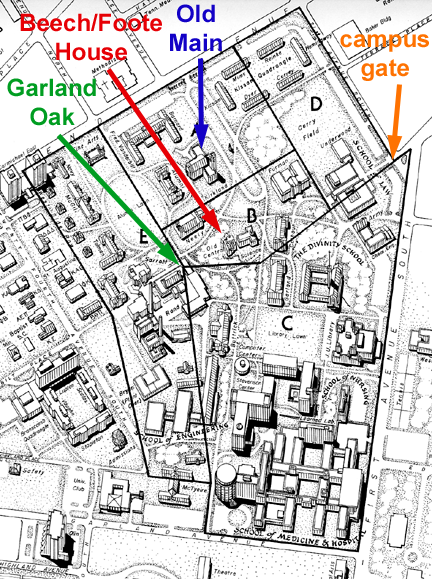 How I got into trees — all the way from bur oaks to Big Al. Vanderbilt Register vol. II no. 3 (Sep. 4, 1981) p.9. 7 The Trees of Vanderbilt: Seven Walks Through the Vanderbilt University Arboretum, 1994, p. 26. 8 Hogge, 1998, p. 5. Quote of Mrs. Arthur Ingersoll from 1922. 9 Hogge, 1998, pp. 7-8. 10 Hogge, 1998, p. 193. Quoting Aileen Bishop’s 1965 history of the Vanderbilt Garden Club. 11 Hogge, 1998, pp. 29-35. 12 Vanderbilt Garden Club Records, Vanderbilt University Special Collections Manuscript #473. 13 Vanderbilt Garden Club Records. 14 Hogge, 1998, pp. 35-36. Quoting a report by Mrs. S. R. Schealer. 15 Hogge, 1998, pp. 59. 16 Pendleton, Nicki. 1987. Tree Time at VU. Vanderbilt Register vol. VII no. 39. (June 26, 1987) p. 3. 18 The Vanderbilt Register vol. VII no. 40 p.2 (July 10, 1987) corrects the erroneous value of one million dollars given in Wilcoxon, 1981. 19 McGaw, 1978, p. 27. Quoting 1893 innagural address of Chancellor James Kirkland. 20 Hogge, 1998, p. 40. 21 McGaw, 1978, p. 83. 22 Hogge, 1998, pp. 41-43. 23 McGaw, 1978, pp. 137-8. 24 Hogge, 1998, p. 60. 25 Doll, Gay Nelle. 2001. In the Company of Trees. Vanderbilt Magazine Winter/Spring 2001, p. 16-19. Thanks to the staff of Vanderbilt Special Collections for their help in locating materials in the archives. Special thanks to Phil Nagy for searching for and scanning historic images in the archive’s image collection.